Investing in cycling received a big boost in 2015 with the government’s Urban Cycleways Fund. 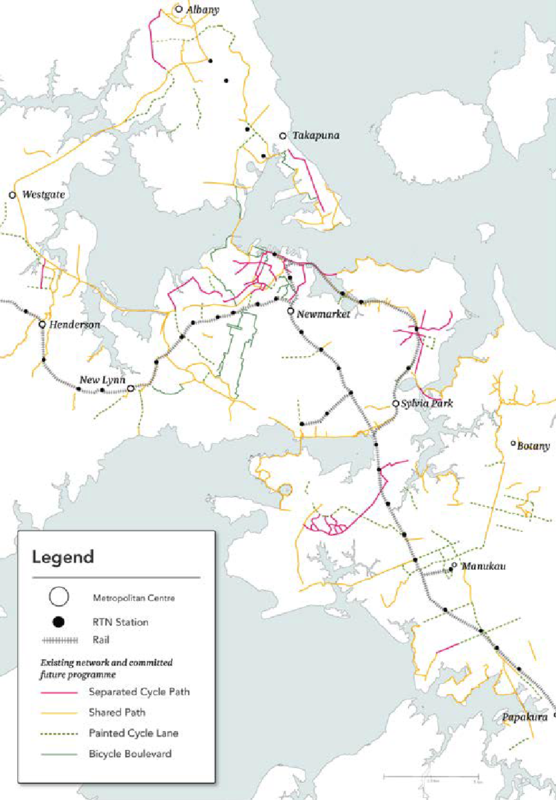 For the first time in Auckland’s history, some decent money was made available for developing a high-quality cycling network. The results of this funding boost are now visible in recently completed projects including Te Ara I Whiti and the Nelson Street cycle lanes, the Quay Street improvements and the Glen Innes to City path. But the Urban Cycleways Fund only scratched the surface in building out a complete cycling network for the city and the funding only lasted for three years to 2018. 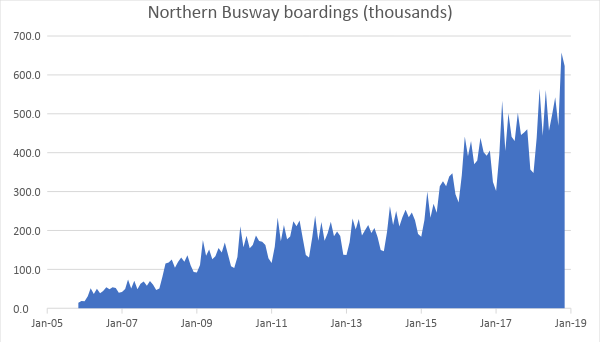 Auckland Transport could see big benefits from its initial investment and needed a strong case for an ongoing, secure source of funding to keep the good momentum on cycling going. Despite a big funding boost, the Urban Cycleways Fund still left plenty of gaps in Auckland’s high-quality cycling network. MRCagney was engaged by Auckland Transport in 2016 to help develop the business case for the next tranche of cycling investment for 2018 - 2028. There were plenty of questions; how much should Auckland be spending? Where across the city should the focus be? Were cycle lanes really the most effective use of funding for improving safety and encouraging more cycling? In a collaborative process with the NZ Transport Agency and Auckland Council we worked within the Transport Agency’s business case transport planning process to answer these questions. The first task was clarifying a clear strategic case for why continuing investment in cycling was a good idea. 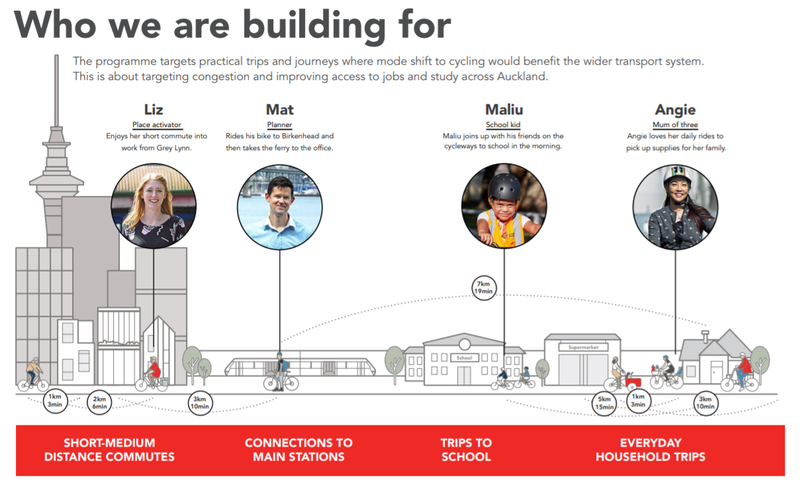 This resulted in defining some key transport problems that investment needed to address, the role of cycling in meeting Auckland’s transport challenge, a set of target users that would benefit from the network development and some principles and standards for network quality. We established that cycling could play an important role in meeting transport demand for short-medium distance trips (generally less than 5km, but a big proportion of household trips), and in doing so could help take pressure off overloaded road and public transport networks. Cycling investment could also play a major role in improving the city’s poor road safety record by providing safer facilities for vulnerable users of the street. A shared consensus emerged that effective future network investment needed to be of a quality that would attract a wide range of all-ages, all-abilities users and that would provide a step change in the level of safety for people on bikes. The business case defined some target trip types and user groups for cycling in Auckland. The commitment to high-quality, but more costly infrastructure meant the question of where to prioritise investment was particularly important. There was a realisation that effective network development was not going to involve loads of green paint scattered across Auckland streets, but more targeted high-quality facilities in locations that would best meet objectives. The MRCagney team used GIS analysis to pinpoint areas where cycle facilities were likely to be most used, address safety problems, or provide benefits to target user groups such as school children. The result was a set of priority locations for investment over the next decade. GIS analysis enabled the team to pinpoint locations likely to benefit most from cycling investment. Finally, the business case process tested the impacts of different levels of investment. Through demand modelling and economic evaluation processes the project recommended an investment of $635 million over ten years, delivering $2-$4 of social, economic and environmental benefits for every $1 invested. The network investment, together with a package of complementary measures like increased bike parking, speed management, cycle training and events were expected to result in a big uplift in cycling numbers with 4,500 people cycling to the city centre in the morning peak by 2028 and overall cycle commute mode share lifting from 1% to 4%. The Auckland Cycling Business Case project was a particularly satisfying project for MRCagney to work on. Not only has the work helped shape future network development, the business case was endorsed by Auckland Transport and NZ Transport Agency Boards and the increase in investment has now become a funding commitment as part of the government’s latest Government Policy Statement. It’s not always that transport planning becomes reality! Karl Baker is now Regional Manager at MRCagney's Melbourne office. He helps clients make compelling cases for transformational urban transport projects. Make sure to check back on Thursday for more!